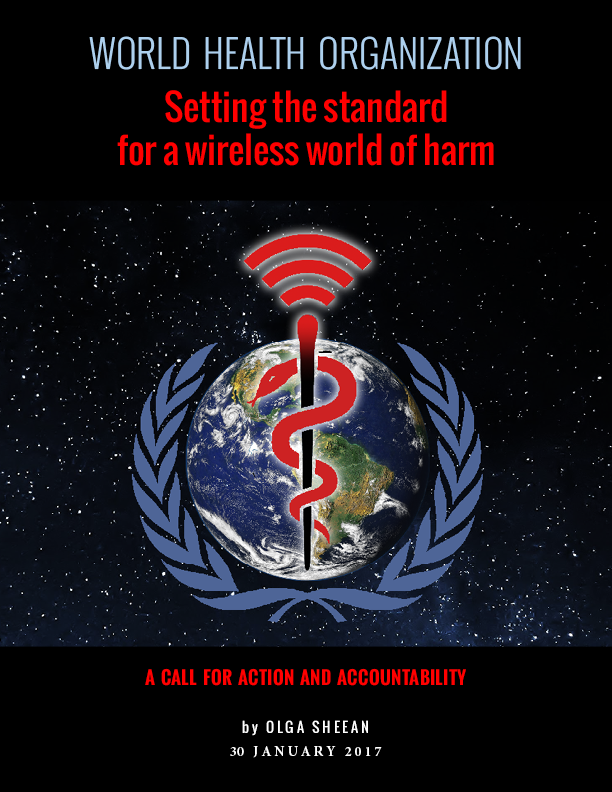 Website editor’s note: Please find below an open letter to the World Health Organization from Olga Sheean on how wireless RF (radiofrequency) radiation (such as is produced by cell phones, cell phone towers, cordless phones, wifi routers, smart meters etc.) is harming human health. . This document provides details of these inexcusable failures and what urgently needs to be done to address them. It also outlines what WHO must do to reverse this destructive course—for itself and for the global citizens it is supposed to protect. One of the most crucial and urgent steps to be taken is the replacement of the head of the EMF Project, Emilie van Deventer (an electrical engineer with zero health credentials) with an independent, unbiased, medically qualified professional who has firsthand experience and knowledge of microwave sickness/ electro-sensitivity and the many other devastating consequences, such as brain cancer, neurological disorders, DNA damage and infertility.